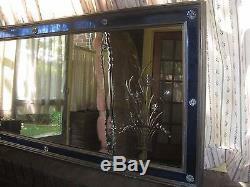 Antique 1920's etched glass mirror. It measures 59" wide, and 25" high. 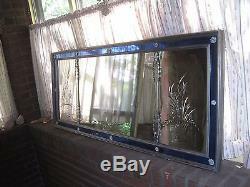 It has three panels, one on each side with an etched design of a basket of flowers. On each side is a beveled raised decoration. 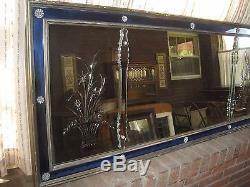 All around is a blue glass mirror border. There are glass rosettes scattered all around. Some small and some large. One large rosette is missing its tiny center, and one rosette is missing a piece. There is some wear to the mirror, and the wood frame. 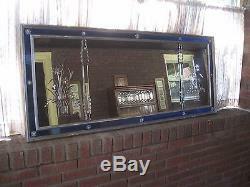 It is in very good condition and ready to mount on your wall. 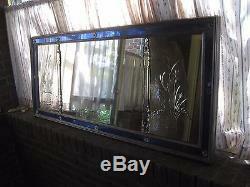 If you are picking this item up (Emerson, NJ 07630). 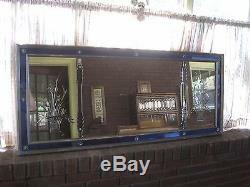 The item "Antique Large Mirror Clear & Etched Blue Glass Wall Mirror 59 x 25 Art Deco" is in sale since Thursday, October 11, 2018. This item is in the category "Antiques\Periods & Styles\Art Deco". 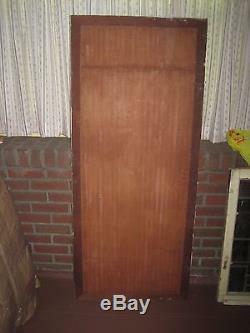 The seller is "prestonjd1" and is located in Emerson, New Jersey. This item can't be shipped, the buyer must pick up the item.